In this blog, we will learn how to check if the Server is in a single-user mode using "SERVERPROPERTY". You can use Windows PowerShell to invoke SQL command on a reachable server within the network using Invoke-Sqlcmd cmdlet, as the following. 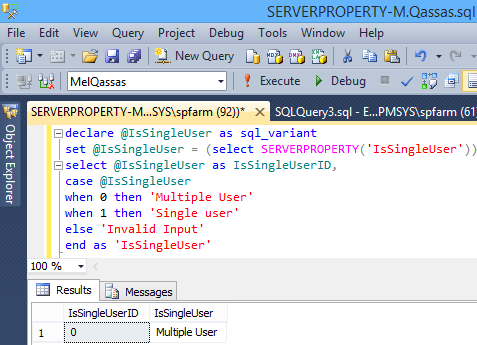 How to get the SQL Server Instance Information using “SERVERPROPERTY”. Download the "Get The Detailed SQL Server Information" Script.